It's possible, even likely, that a proportion of those approaching this double bill of films by French director Georges Franju are doing so on the strength of his 1960 masterpiece Eyes Without a Face [Les Yeux sans visage] and that they are unfamiliar with his much of his other film work. I certainly was until now. The two films here are united by a similarity in style and content, inspired and influenced by the fantasy crime serials of prolific silent cinema director Louise Feuillade, he of Les Vampires and Fantômas. I think it's safe to say that if you're not familiar with Fuillade's films then you're likely to be a little bemused by some of the imagery, costumes and credibility-stretching plot developments on display here. 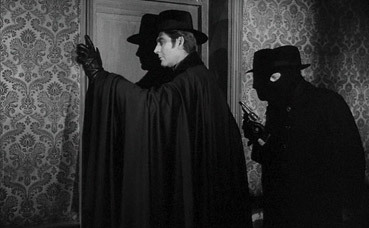 Both films were partially the result of Franju's desire to remake Fantômas (frustrated on each occasion by circumstance and copyright issues) and both function as affectionate homages to the Fuillade serials, being peppered with elements that will be instantly recognisable to devotees but which could leave the unprepared wondering what the hell Franju is up to. Both are intriguing in their own right, but there's a nagging sense that the eleven years that separate the two films are crucial to their varying effectiveness. It all starts straightforwardly enough. Wealthy banker Favraux (Michel Vitold) engages the services of private detective Alfred Cocantin (a sometimes sad-faced Jacques Jouanneau – my money's on Stephen Rae for any proposed remake) to oversee a ball he is throwing the following evening to jointly celebrate the bank's twenty-fifth anniversary and the engagement of his daughter Jacqueline to the Viscount Amaury De La Rochefontaine. Almost as an afterthought, he asks Cocantin to trace the source of a letter he has received from someone calling himself Judex, one threatening him with dire consequences if he fails to give half of his fortune to those he has crossed. It's an intriguing setup. Is Favraux a genuinely bad man or just the innocent victim of a vendetta? It's hard to say at this point, though since he's a banker by trade we tend to suspect the latter. A short while later the elderly and infirm Pierre Kerjean approaches him in the grounds of his plush estate and accuses him of betrayal. It seems that Favraux promised to financially recompense Kerjean and take care of his family if he kept his mouth shut and did a prison term for him. Favraux kept his word on neither count and Kerjean emerged from jail to discover that his wife had died in poverty and that his son has disappeared. Unconcerned with this old man's problems, Favraux orders his ageing, long-bearded secretary Vallieres to give him a few coins and send him on his way. I began to think that this Judex fellow might have a point. In case you're still sitting on the fence, a short while later Favraux is out for a drive when he sees Kerjean hobbling down the road. Instead of offering him a lift he deliberately runs him over and leaves him for dead. By this point you should be rooting for Judex to do the bugger in. What has played relatively straightforwardly up to this point takes a sharp turn for the strange on the night of the aforementioned ball, an affair we are led into by a man wearing a disturbingly realistic bird's head and mournfully carrying the carcass of a dove through a crowd of masked dancers, who stop to stare as he passes. It plays like a dream, but a plausible explanation is just around the corner, a "what the hell?/oh I get it" technique that Franju re-employs in subsequent scenes. Looking fate defiantly in the face, Favraux chooses to make a toast as the clock strikes midnight, at the very moment that Judex had promised his vengeance, but has barely got a word out when he drops dead on the spot. Good thing too, you may think, but with a key aspect of the initial plot setup effectively concluded, where does it go from here? Well there's Marie, the good-looking private tutor to Jacqueline's young daughter Alice. Favraux proposed to her earlier and she's now kicking herself that she didn't accept. As it turns out she was only after his money anyway, and with the help of her boyfriend Morales she plans to break into the house and grab some incriminating documents that could still net them a small fortune. Jacqueline, meanwhile, has been told by Vallieres of her father's misdeeds and has rejected her inheritance as a result. She's still at the house when Marie and Morales break in, and after she interrupts them they knock her out and kidnap her, only to be stopped in their tracks by three protective Alsatians and a black-dressed man, who returns Jacqueline to her quarters and promises to come to her aid should she ever need help. Having killed her father, Judex is now offering protection for her daughter. Why would that be? Of course there's a lot more going on here than I've chosen to reveal. Who, for example, are the black-dressed figures who steal into the grounds at night and make off with Favraux's body? Just who is the mysterious Judex and what exactly did he have against Favraux? And what has become of Detective Concantin, who drops completely out of the plot until a title card appears asking that very question? Ingenious if occasionally unlikely answers are provided to all of these questions and a lot more besides, including the reunification of the Kerjean with his missing son at a moment whose outrageous improbability made me laugh out loud, but which is perfectly in keeping with the film's source material. If I was completely sold on Judex, I found myself a little less certain about Nuits rouges, Champreux's and Franju's second homage to the cinema of Louis Feuillade. It's partly a matter of aesthetics – the colour imagery distances the film further from the look of the original films and, given the nature of what unfolds within, more readily recalls the Emma Peel-era colour Avengers episodes. But it's also a matter of content. Where Judex confidently walked a fine line between implausibility, surrealism and straight drama, Nuits rouges occasionally oversteps that line and stumbles. Absurd is fine, but there are times here when Champreux and Franju start to push their luck. Given that the film is a compression of a simultaneously shot 8-episode TV series, it's no surprise that the plot kicks off at some speed. 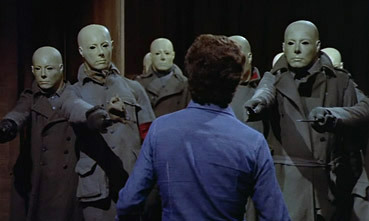 In an attempt to solve his monetary issues, butler Albert trades some information on his master, Maxime De Borrego, to a gang headed by a master criminal known as The Man With No Face (played by screenwriter Jacques Champreux). He does have a face as it happens, one that allows him to disguise himself as the wizened old woman that Albert brings the information to, but most of the time it stays hidden behind a red mask, which presumably gives him colour authority over is black-hooded troops. Maxime, they learn, may know the location of the fabled treasure of the Knights Templar, and that's something The Man With No Face desperately wants to lay his hands on. Before they proceed, however, he needs to check the authenticity of this claim. How does he do this? By walking into the Maxime's study that evening, dressed in his red mask, and asking him. When that doesn't elicit the required response he tortures and kills him. We are, of course, just getting started here. Superintendent Sorbier wants to know who killed Maxime and why, Maxime's nephew Paul wants to know who killed his uncle and who the bloke who turned up earlier pretending to be him was, and the brothers of the Order of the Knights Templar want to know who killed one of their holy number so that they might smite him. The Man With No Face, meanwhile, remains determined to track down the treasure and is quite prepared to go through Paul and his friends – who include confidant Martine, her beefy boyfriend Séraphin and renowned historian Professor Pétie – to get it. Being a master criminal he's got specialist help in the shape of a deadly female assistant, a collection of masked goons, and a mad doctor who uses electronics to turn people into obedient zombies. All of which sounds like a riot and maybe it is. In the accompanying interview, screenwriter Champreux suggests that Nuits rouges is actually a gentle parody of Feuillade's Fantômas films, but if so then the key word here is gentle. Maybe I've spent too long being assaulted by the unsubtle, but I was genuinely uncertain whether Champreux and Franju were playing it straight, sending it up, or dancing somewhere between. The elements are all in place, from the hooded villains to the black-clad female in a night-time rooftop pursuit, but it's hard to be sure whether the sometimes pantomime characterisations and implausible narrative twists are the result of comical intention or an audience tolerance risk-take. If you do take it seriously then you may find your patience tested by some dues ex machina plot twists and timing, and a decidedly variable set of performances by a sometimes dubbed international cast (who include Gayle Hunnicutt, Josephine Chaplin and Gert Fröbe, most famous to English-speaking audiences as Bond über-villain Auric Goldfinger). This peaks with two outrageously scene-chewing turns by Clément Harari as Doctor Dutreuil and Henry Soskin and Professor Pétrie – you may think Pétrie is OK the first time we meet him, but just you wait until his TV appearance later. The aforementioned similarity to the more camp Avengers episodes makes the parody theory easy enough to swallow, but it's only going to work on this level for those familiar with the Feuillade's serials, and even then we're talking smiles of appreciation rather than out-loud laughter. It's a fun film nonetheless, and no-one could accuse the writer and director of lacking imagination and nerve. And nestled in amongst the brisk implausibility is a genuinely creepy sequence in which Paul and Séraphin are attacked by a slowly advancing gang of knife wielding showroom dummies. That the pair effect their escape by a ludicrously unlikely discovery, and the fact that Doctor Who had the jump on them by four years with the Autons is neither here nor there. Judex is presented in a generally impressive 1.66:1 anamorphic transfer, whose contrast and detail are pleasing and whose black levels in night scenes are bang on. Some film grain is visible but not a problem, and dust and damage are rare. On the whole a very nice job. Nuits rouges has been transferred from a French Digibeta master, which was non-anamorphic 1.66:1, an aspect ratio that has been retained here. It makes sense, as to anamorphically enhance the picture would effectively involve stretching it in the very same way your TV will do anyway if you engage the 14:9 zoom mode. In all other respects, though, this is a fine transfer from a very good print – colour, contrast and sharpness are all very good and I was surprised just how well the picture here upscaled to HD, given that I was also enlarging the picture to vertically fill the screen. Pleasingly, MoC have accommodated this by placing the removable subtitles in the picture area. 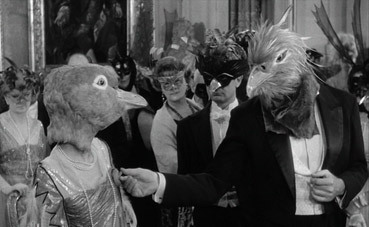 According to screenwriter Jacques Champreux, some of the 35mm footage shot for the feature version was stolen and had to be substituted with 16mm blow-ups. It's a testament to the quality of the print used here that you'll be pushed to spot where this theoretically lower quality material sits. Both films feature mono 2.0 soundtracks. Being the older film by 11 years, Judex betrays its age more readily with some minor crackle and the odd bit of damage noise, though this is not serious enough at any point to distract from the film. Nuits rouges fares batter, the limited dynamic range the only real ageing issue, as otherwise the soundtrack is clean. The co-writer of Judex and the grandson of Louis Feuillade usefully outlines how the project came about and was developed, specifically in reference to Feuillade's original serial, from which there are several good quality extracts. He also talks bout the casting of two of the key roles, the thinking behind the masked ball sequence (this is particularly interesting) and the differences between the cinema of Louis Feuillade and Georges Franju. 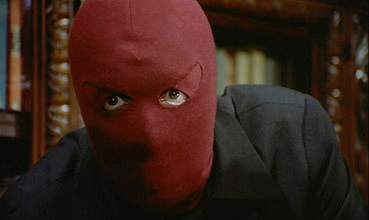 Once again Champreux provides concise and interesting background information to the production, including the simultaneous filming of both the TV and film versions and his decision to keep to himself the influence of Spider Man on the villain's trick of firing knives from his wrists because Franju hated comic books. The typically excellent MoC booklet includes full credits for both films, a poetic 1984 essay by Franju on the film, an except from a 1963 interview with Franju conducted by Jean-André Fieschi and André S. Labarthe, a particularly informative 1984 interview with Franju for L'Avant-scène cinema, a short article on Judex by Jacques Rivette, three brief passages of praise for Judex, and an extensive 1975 conversation with Franju by Tom Milne. For all my uncertainties regarding Nuits rouges – a film I'm nonetheless increasingly warming to – this 2-disc set has to be considered an essential purchase for anyone interested in the cinema of either Georges Franju or Louis Feuillade, and good humoured surrealists everywhere. Chalk another specialist success up for Masters of Cinema.